A yellow diamond is unique and elegant. Read this ultimate guide to learn what to look for in a yellow diamond and how pricing works. If you like to stand out, consider a yellow diamond for your engagement ring. Yellow diamonds make a bold statement compared to the traditional colorless stones, but are still elegant and classy. They're like little sparkly drops of sunshine and joy. However, they're not the easiest to buy. There's a whole new set of criteria when choosing a yellow diamond. Read on to learn exactly how to buy the perfect yellow diamond. Yellow diamonds belong to what we call "fancy colored diamonds." Diamonds can come naturally in almost any color, including purple, pink, red, blue, green, gray, and any other hue. Fancy colored diamonds are a lot more rare. Colored diamonds are formed when there are other elements or atomic structural changes. Yellow diamonds are formed when there's presence of nitrogen. 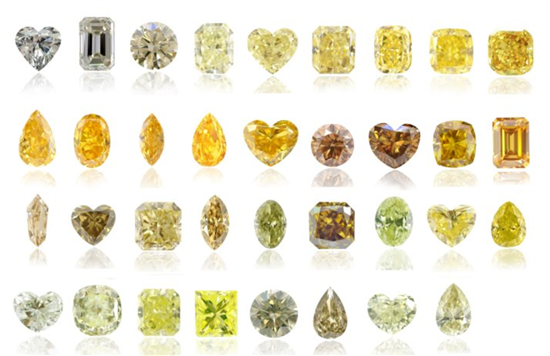 Of the colored diamonds, yellow is the most common, making up 50% - 60% of all naturally colored diamonds. Because they're the most common, yellow diamonds cost less than other fancy colored diamonds. But the cost depends largely on how intense the yellow color is. Yellow diamonds are often called canary diamonds. BUT this term may be misleading. Real canary diamonds are vivid, pure yellow stones and are very rare and expensive. Most yellow diamonds are not true canary diamonds (as we'll explain in a bit). With colorless diamonds, you're used to the D (completely colorless) to Z (brown tint) color scale. Yellow diamonds have an entirely different color grading. 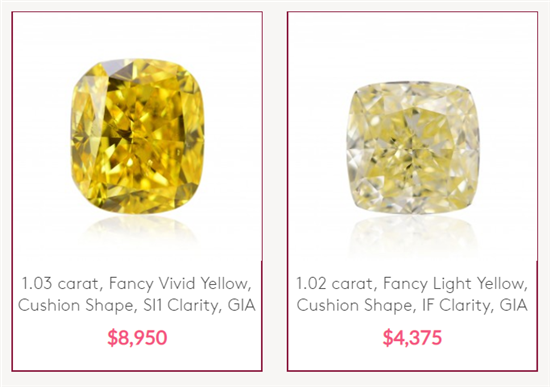 The stronger the yellow color, the more expensive the diamond will be. True canary diamonds only refer to the fancy vivid and fancy intense yellow diamonds. This color range is the most desirable and valuable. The color scale actually begins at Faint, Very Light, and Light. But they're not used for yellow diamonds, because these grades actually fit on the color scale for colorless diamonds. Besides the intensity of the yellow color, another thing to look for is the hue modifier. Most colored diamonds have a secondary color or tone, called the modifier. This image shows all the possible colors and hues for yellow diamonds. Green Yellow / Greenish Yellow. The modifier will be listed first, and the dominant color of the diamond will be last. For example, you may see the color listed as "Fancy Light Orange Yellow." 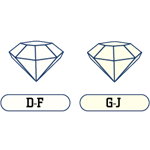 This means that the diamond is a light yellow diamond with an orange tint. "Brown Yellow" will be a little bit more brown than "Brownish Yellow". Just like "Green Yellow" will be a little more green than "Greenish Yellow". The most common secondary colors for yellow diamonds are orange and green. A slight difference in hue could be a big difference in price. A canary diamond is a Fancy Vivid or Fancy Intense pure yellow diamond with no secondary colors. Make sure you buy fancy colored diamonds with a proper GIA (Gemological Institute of America) certificate. The GIA grades and certifies the exact color and intensity of naturally colored diamonds. For colorless diamonds, cutters cut the diamond in a way that it reflects the most light. It's all about the proportion and symmetry. Round diamonds are the most popular because they're the most brilliant. But for fancy colored diamonds, they're cut in a way to bring out the most color. Proportion, symmetry, and light performance don't really matter. What's important is how the color looks. Fancy colored diamonds aren't given a cut grade. This is why most yellow diamonds are not round cut. Fancy colored diamonds usually display a more intense color when they're cut into another shape, such as oval, pear, emerald, radiant, and cushion. Tip: Yellow colored diamonds look especially good in halo settings. 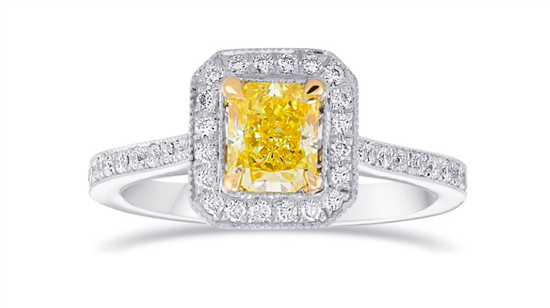 A ring of colorless diamonds around the yellow makes the color pop even more. For colorless diamonds, it's important to buy an eye-clean diamond. But for fancy colored diamonds, clarity doesn't matter so much because the color can hide flaws. Again, it's only the color that's important. In the above example, you can see that a Fancy Vivid yellow diamond with lower clarity grade is a lot more valuable than a flawless Fancy Light yellow diamond. Yellow diamonds could be affordable or extremely expensive. Again, it mostly depends on the intensity of the color and the hue. The more intense the yellow color is, the pricier the diamond will be. Fancy Vivid diamonds are usually the most valuable. It can cost more than a completely flawless and colorless diamond of the same shape and size. Fancy Deep and Fancy Dark yellow diamonds are usually not as valuable. These typically have brownish tints. A Fancy Light yellow diamond can even be cheaper than a colorless diamond of the same characteristics. Because a light yellow tint is not as desirable as just completely colorless. A colorless 1.21-carat cushion-cut diamond of H color and VS1 clarity goes for $5,910. A fancy intense yellow 1.2-carat cushion-cut diamond of VS1 clarity goes for $7,440. Yellow diamonds with a brown hue modifier will be the cheapest. Even a slight brown tint can reduce the price significantly. Yellow diamonds with a green hue modifier can be even more expensive than a pure canary diamond, because green diamonds are more rare in nature. Same goes for orange tints. Basically, yellow diamonds can be extremely affordable if you're okay with a light yellow color or a brown tint. On the other hand of the spectrum, they can be very expensive if you want a very vivid yellow color. 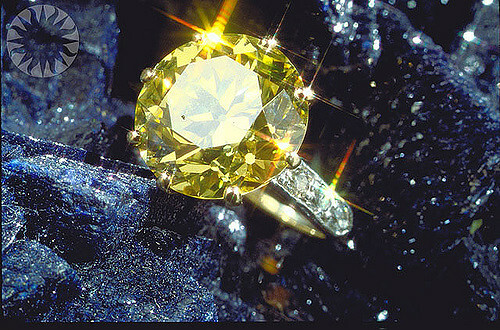 Yellow diamonds occur in the D-Z color scale for colorless diamonds too. Usually, diamonds with a K color grade and lower will have a yellow tint. However, they're not true yellow diamonds (as they're not graded in the Fancy color scale). They're basically cheaper colorless diamonds with a yellow tint. But these diamonds can be very affordable. 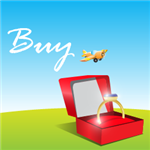 This allows you to purchase a larger diamond for less, so it's definitely an option worth considering. Settings can make a huge impact on a yellow diamond. Depending on the ring style and metal color, the yellow diamond could even appear different in color. White metals (like white gold and platinum) will create contrast against the yellow diamond, but it may make the color appear a little lighter. Yellow gold can make a yellow diamond appear even more yellow. You can save a little money by purchasing a lighter yellow diamond and mounting it in a yellow gold ring. The ring will have a very warm overall look. A halo setting is one of the best ways to make your yellow diamond pop. A ring of white diamonds will really bring out the yellow center stone. Other sidestone settings, like pave and three-stone, will also put more attention on the yellow stone. Your local jeweler may not have a lot of yellow diamonds in stock. So you may be limited to just a few choices. And they may not have the shape, color, or size you want. Leibish & Co. Leibish and Co. is the leading jeweler specializing in natural colored diamonds. They have a large inventory of yellow diamonds (and other colors) in all shapes and sizes for all budgets. It also makes jewelry in order to showcase the beauty of colored diamonds. James Allen. Already one of our favorite online jewelers, James Allen also has a large selection of colored diamonds. You can view each diamond in a 360-degree HD video. To find the best price on a natural color yellow diamond, you're going to need to spend some time shopping and comparing prices. You'll want to do some online shopping as well. 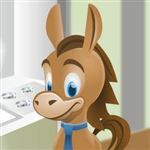 Even if you choose not to buy the diamond online, this will give you a good idea of what you should pay, so you can negotiate with your local jeweler. A yellow diamond is a beautiful choice for an engagement ring. It can be relatively affordable based on the color intensity. It makes a good choice for those who want something different, but still won't break the bank. Just make sure that your yellow diamond is properly certified by GIA. Share on Facebook "Yellow Diamond: What You Need to Know"